I went to Bowra Station near Cunnamulla, SW Queensland, to meet some birding pals from Victoria for Easter. 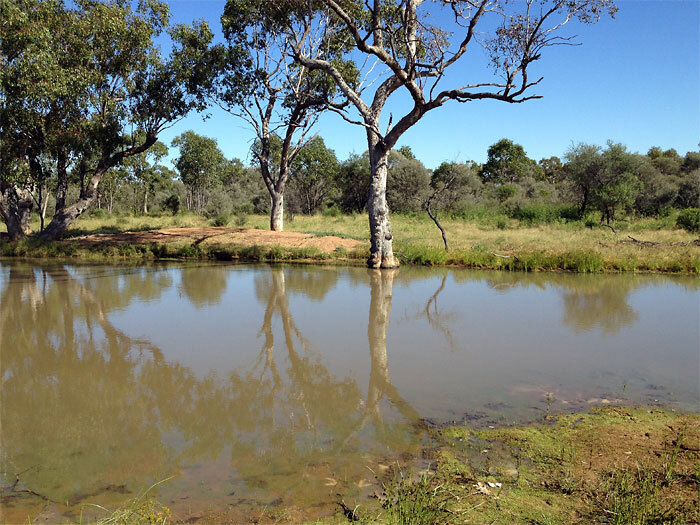 Cunnamulla is almost exactly half-way between Bluewater and Melbourne by the shortest inland route (2,532km Bluewater-Melbourne CBD) and Bowra is an AWC reserve, famous for its dry country birds and wildlife. I returned with an intractable bout of flu which has left me horizontal for 2 weeks, but I am now much better and able to tackle long-neglected tasks like the Bird of the Week. So, here is something worth waiting for, one of the less-well known endemic Australian raptors, the Black-breasted Buzzard. At the end of the drive from Bluewater to Bowra, I saw this raptor perched on road-kill – the euphemism used here for run-over native wildlife – near the entrance to Bowra, thought ‘that’s not a Black Kite’, turned the car round and picked up my camera to take the first photos of the trip. Reluctant to leave lunch behind, it tolerated my approach for about 30 seconds before flying away into the afternoon sunshine, second photo. In both photos, you can see the long, hooked bill that gives it its generic name (hamus is the Latin for hook), reddish crown and nape and the beginnings of it eponymous black-breast. In flight, you can see the characteristic white wing patches on the middle of the first six primary flight feathers, probably its best field mark and the complete absence of barring on the wing and tail feathers. This was the first time I’d seen a Black-breasted Buzzard either close up or perched. Mostly, one sees them singly and infrequently in flight soaring in the open skies of the drier parts of Australia. They’re common enough to have an official status of ‘Least Concern’ but uncommon enough to give me a thrill each time I see one. Apart from concerns of rarity, they’re impressive birds in their own right, being, I have just discovered, the third largest Australian raptor with a wingspan to 1.5m/5ft and an expert at soaring. Two days later, we stopped for lunch at this dam at the far end of the property, about 15km/10 miles away from the entrance. A Black-breasted Buzzard soared high above us and then came round and flew overhead for a closer look, fourth photo. Comparing the pattern of wear on the flight feathers, indicates that this was the same individual. In this photo, the black breast of the adult bird is obvious as are the rusty flanks. Apart from dark blotches on the wing linings, the lack of barring is also apparent. 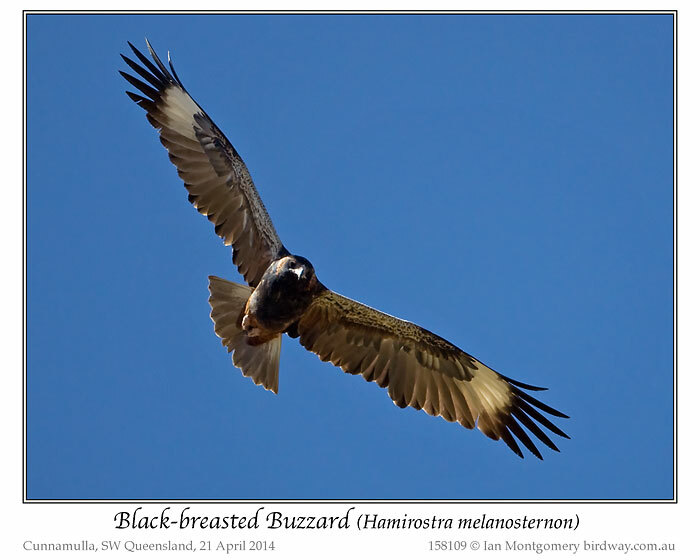 Black-breasted Buzzards are known to feed on carrion and live prey, but their speciality is the eggs of large ground-nesting birds such as Brolgas, Bustards and even Emus. The latter have tough eggs which even that hooked beak would have trouble penetrating so, amazingly, these birds use stones to break them, dropping them from either a standing position or in flight. Though they are thought to belong to a rather ancient Australasian lineage of raptors this use of tools elevates them globally to the top of the class, sharing this position with the Egyptian Vulture which also throws stones at eggs. 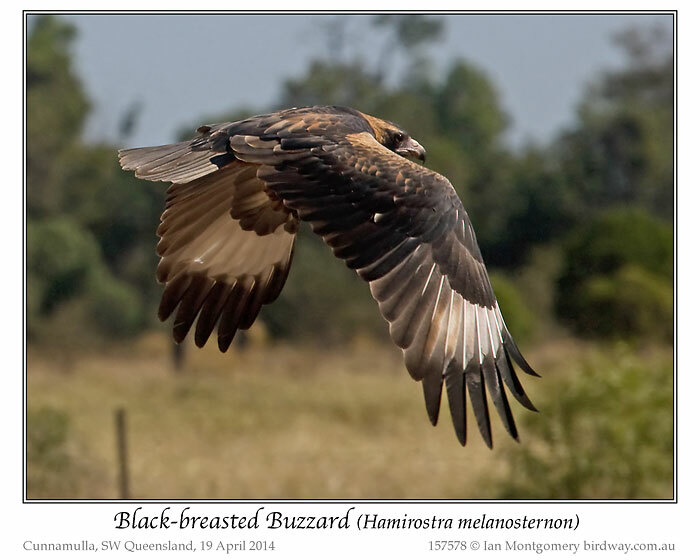 The Black-breasted Buzzard is the sole member of its genus (monotypic) and its closest relative is though to be the Square-tailed Kite, another monotypic, uncommon Australian endemic with dubious, gastronomic tastes, in its case nestlings. This ancient lineage is thought include a third Australian endemic, the Red Goshawk, and several New Guinea species including the long-tailed buzzards and perhaps the New Guinea Harpy Eagle. This just goes to show how indiscriminately common names like buzzards, goshawks, kites and eagles are applied to raptors. The last photo shows a juvenile Black-breasted Buzzard photographed at a joint pre-merger Birds Australia and Townsville BOCA outing to a dry country station called Pajingo, south of Charters Towers in 2009. As you can see the juvenile lacks the black breast of the adult, though pale patch on the wing is very similar. At the time, we unanimously agreed that this was a pale morph Little Eagle. I posted it at such on the Birdway website and it wasn’t until last year that the error was brought to my attention. 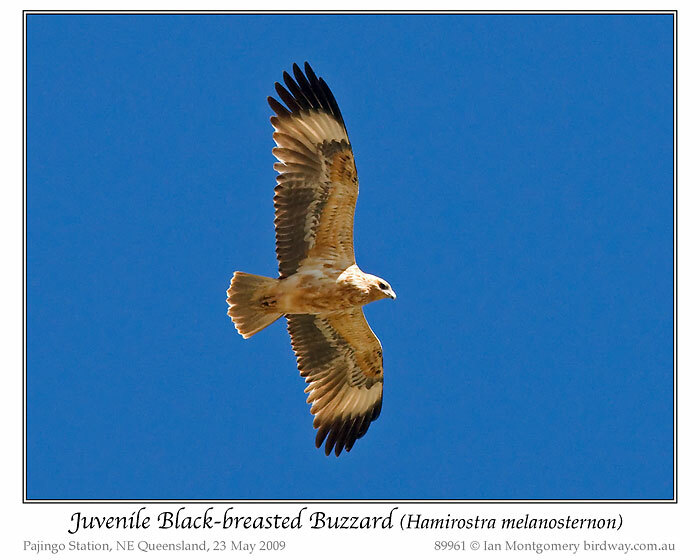 This is what Steve Debus, one of the Australian experts on raptors said: “the image shows virtually no typical light-morph Little Eagle characters, such as the pale ‘M’, or the barring on flight feathers (including primary ‘fingers’) and tail, feathered legs etc.” and other points made were the long, slender bill of the Black-breasted Buzzard and the ‘chunkier’ head of the Little Eagle. Good to know. What a neat bird, but I agree with the verse. Don’t think I would care to eat a buzzard, especially after it eats “road-kill” The colors on this Buzzard are really neat and would help it stay disguised until it is too late for its prey. The Black-breasted Buzzard is a member of the Accipitridae – Kites, Hawks & Eagles Family. Out of the 256 species in the family, 28 of them are Buzzards. I just realized that I have not had any articles in the Birds of the Bible for Buzzards. Will have to make a page for them. Stay tuned. 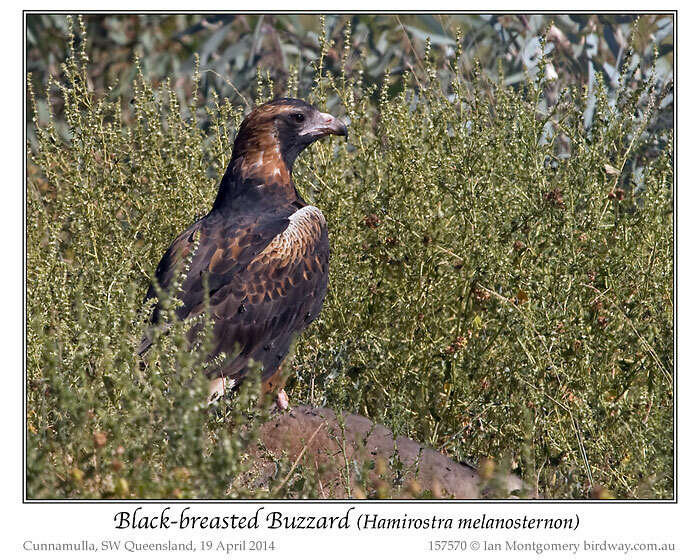 This entry was posted in Bird of the Week and tagged Australia, Birds, Birdwatching, Bowra Station, Buzzard, Endemic, Home School, Ian Montgomery, Nature, Photography. Bookmark the permalink. Hola mi nombre es José Pablo, de soja Guía de la fauna mediterránea en la provincia de Castellon, realizo excursiones en Castellón, ejerzo de Guía Para El avistamiento de la fauna ibérica en Castellón, concretamente en Las rapaces, carroñeras, cabra hispánica pyrenaica, corzo, etc mi empresa Llama del SE avistanatura y Tengo pagina web. Hello my name is Jose Pablo, soy Guide Mediterranean fauna in the province of Castellon, I make trips Castellón, I exercise Guide To The sighting of the Iberian fauna in Castellón, specifically Raptors, scavengers, pyrenaica ibex, roe etc. my company se llama avistanatura and I website.